Emergency service workers in Red Deer and Central Alberta are continuing to answer the call to help save more lives as part of this year’s Lifesaving Summer campaign, and Canadian Blood Services is asking local residents to also lend their arm by donating blood in support of their local emergency services teams. The campaign runs through to Aug. 31st. 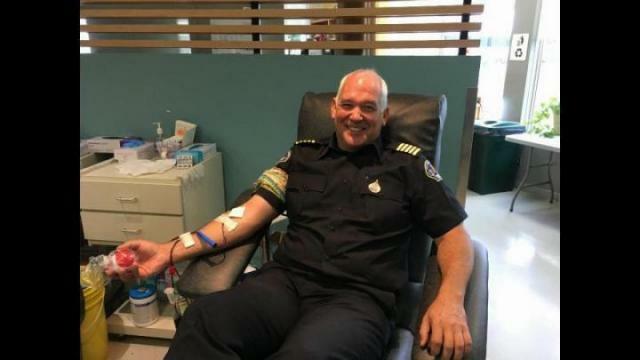 On Friday a number of RCMP members and Emergency Services members were on hand at the Canadian Blood Services clinic in Red Deer to kick off this month’s challenge. Emergency service workers often see the need for blood firsthand. Just one person who is seriously injured in a car crash could need as many as 50 blood donations to help save their life. The goal of the Lifesaving Summer campaign is to collect 1,308 units of blood in Red Deer and the Central Alberta area. In addition, officials hope to recruit 163 new donors for this campaign. Wild said she encourages Red Deerians to donate blood. Donna Sherban, a firefighter inspector with the City of Red Deer, was also on hand to donate blood. “I’m here for public awareness and to encourage people to come out and donate as well. In the summertime there is definitely more need for blood in the community,” she said. For more information, call 1-888-2-DONA TE or visit blood.ca. The Red Deer Canadian Blood Services clinic is located at 5, 5020 68th St.